Often there are situations, when, like, done correctly, but still does not work. In this article we look at the main "fault" of Skype and troubleshooting. Check the firewall settings. maybe, Skype is blocked this program. For, to-back computer does not complicate its use, add Skype to the allowed list (trusted) applications in the firewall settings. In this case, the program will be free to access the internet, and the problem will disappear. If you can not log in to the program, the, probably, reason in the wrong username or password. If you have forgotten, you can regain access to Skype. A common cause of "failure" of Skype - absence of the user Internet connections. If the program does not start, first check the availability of communications. To do this, you can check the ping or try to open some Web sites through the browser. If the Internet is not - hence the reason, that Skype does not work. Check the connection settings, wire, router settings, balance on the account provider. In an extreme case,, contact your technical support provider to solve connection problems. Sometimes it happens, that Skype does not work because of their own system error. To fix it, you need to open the Start menu and the Run menu, enter% appdata% skype and click OK. In the opened folder, locate the file Shared (or Shared.xml) and remove it. Then you need to re-launch Skype. The program should work. If none of the methods does not help, Antivirus check the system and reinstall Skype. 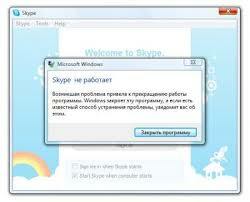 If, in this case it does not work, contact the technical support of Skype.